Everyday isn't promised to be bright and sunny, but carrying a bright yellow bag this season can definitely lift your spirits. If it doesn't elevate your mood even a bit, it'll definitely brighten up your look. 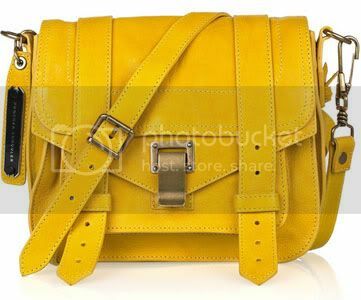 I've definitely been craving a yellow handbag and this Proenza Schouler small leather satchel would be perfection in my closet. The things I would do with this...but I'll keep those thoughts to myself. In the meantime I'll wrap my head around a few budget-friendly yellow options. What say you? OMG ... that Proenza Schouler bag is perfection for summer. They have a larger size in melon that I also am obsessing over. Oh to have all the money in the world to buy whatever bag I desire. LOL! Yes! that PS satchel is amazing. Yellow is back for summer. I've been thinking of rocking a yellow mani for the summer again. Oh I love that Mod Cloth bag.. That's a nice budget friendly knock off! lol... Cute. This post caused me to break out the kool-aid smile. It's beautiful! Pricey but beautiful :) I have yellow shoes. And they make my days sunnier, lolol.